It’s true; the light and colour experienced on holiday won’t translate when you get home… which is all the more reason to enjoy it whilst you’re there! This latest design trip was a must from our perspective; Barcelona is such a playful city growing in architectural merit. Below is a little rundown of 5 must-do experiences when visiting this young and vibrant city; and no, it doesn’t include sangria or paella! 1. Ignore your mother and wander the streets at night. This city knows how to play with its light. Markets are revered in Barcelona with easy-to-spot coloured soaring roof lines. 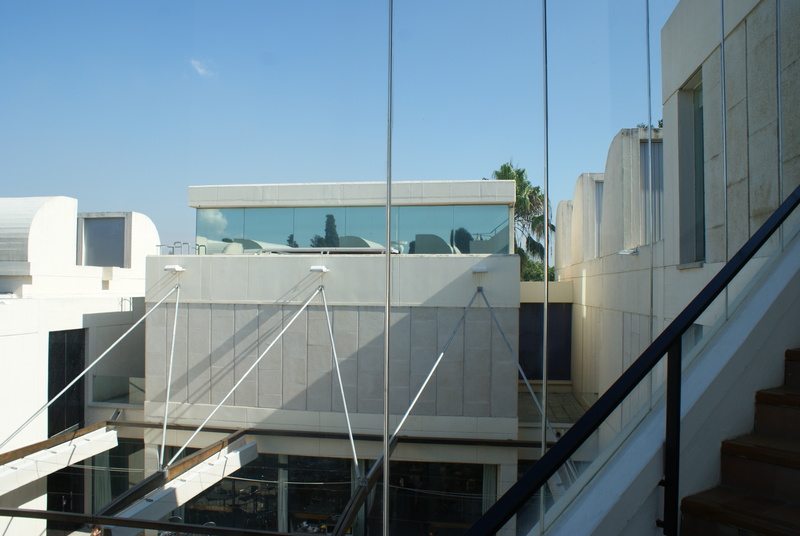 This market is one not to miss for its creativity (Els Encants Vells) and is located next to the very cool BRUUMRUUM! graphic light installation. 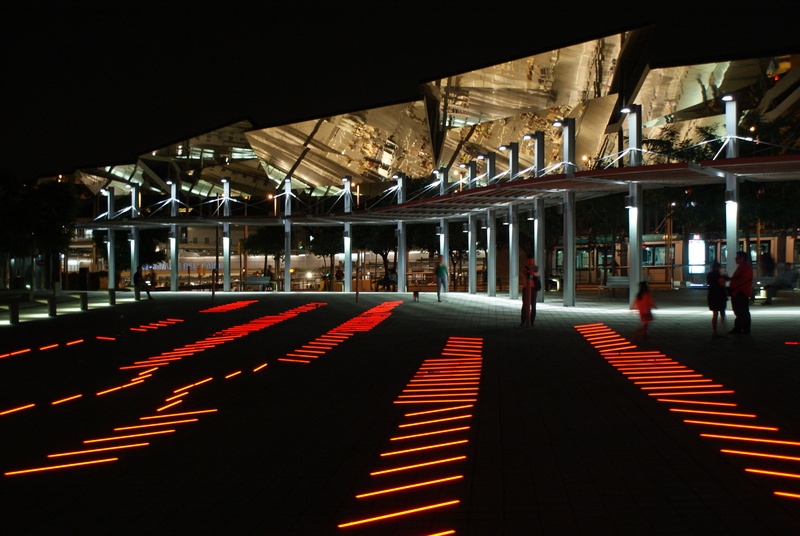 The idea was ‘to create a special dialogue between citizens and public space through the use of sound and light’. It reacts to the intensity of voices and ambient sound generated by the city and consists of coloured lights in constant motion, occasionally blacking out. Let’s put it this way; it wasn’t just kids stopping to play with it! 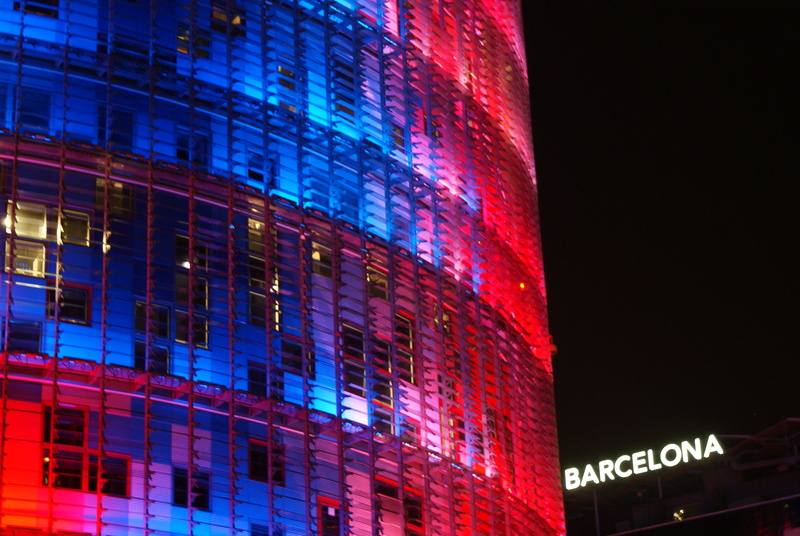 The Torre Agbar is hard to miss; a 38-story skyscraper marks the gateway to the new technological district in Barcelona and is the epitome of colourful light. Designed by French architect Jean Nouvel and opened in 2005, its defining feature is its nocturnal illumination via 4,500 LED devices on the facade. This ‘simple’ LED system enables the building to create up to 16 million colour combinations which is frankly mind boggling! Even from the pavement you were seduced by light, lit building receptions made you momentarily stop to bathe in their glow. Compared to the above photos, they feature infinitely less colour, but had atmosphere in bags. One of our favourite activities was wondering through the backstreets and coming across a plethora of original 50s and 60s receptions. Left open to appreciate via giant spans of clear-glass windows, lit softly and showcasing an array of original tiling, brickwork, cladding and letterbox/pigeonhole designs it was like walking past mini-film sets! 2. 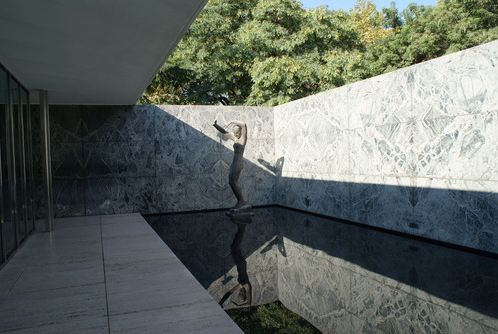 Visit the Mies Van de Rohe Pavillion first thing in the morning to experience the calmness and sleekness of this stunning environment alone. The pavilion was built for the 1929 International Exposition and was the face of Germany after WW1 showcasing the nation’s progressively modern culture. The idea wasn’t to build a dwelling, instead a calm space to escape from the exposition, an inhabitable sculpture made from rich natural materials. Built from marble, steel, chrome and glass this building isn’t messing around. 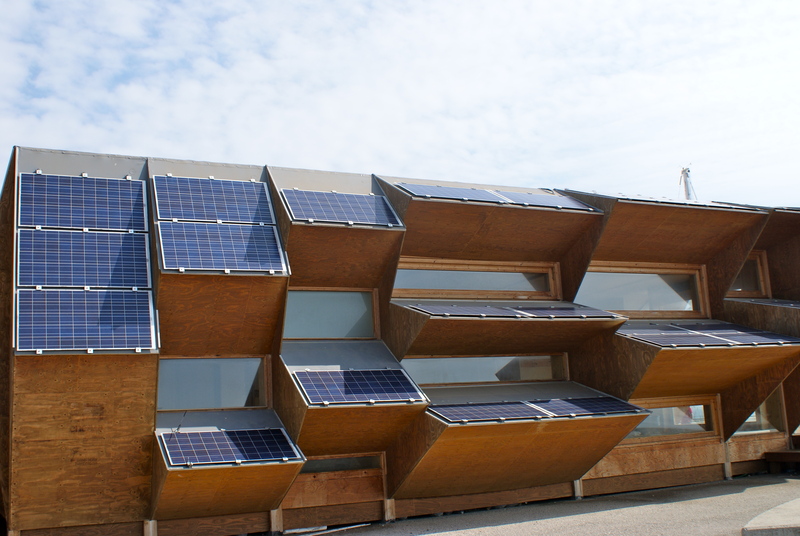 It is however softened by the roof which appears to float over the interior/exterior. The pavilion offers new perspectives as you move around the building through the use of offset parallel walls which gives you that all important ‘journey’. It feels like you can choose how to explore the space. 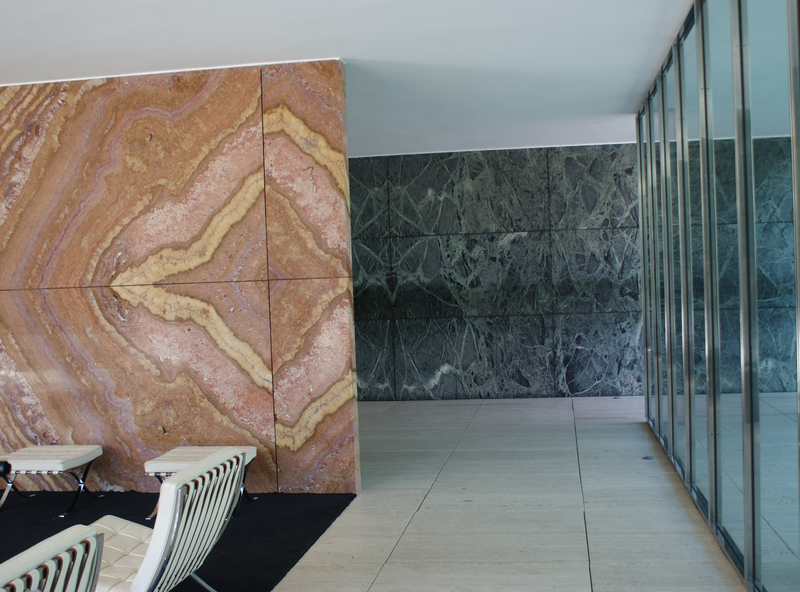 Using the sun, two pools as well as the choice of marble itself act as secondary light flooding into the interior spaces. In 1930 the original pavilion was dismantled but reconstructed in the 1980s by a groups of Catalan architects using salvaged drawings and photographs. It’s a shame it isn’t the original but has been cleverly done and is worth setting your alarm clock for! 3. Trek up up (and up!) Montjuic to experience the Fundacio Joan Miro. The building was probably a concrete shutterers’ nightmare but is an unbelievable building to experience; truly fit for purpose and you can wonder around the roof to take in the unconventional structure and shape (as well as one incredible view across the city). 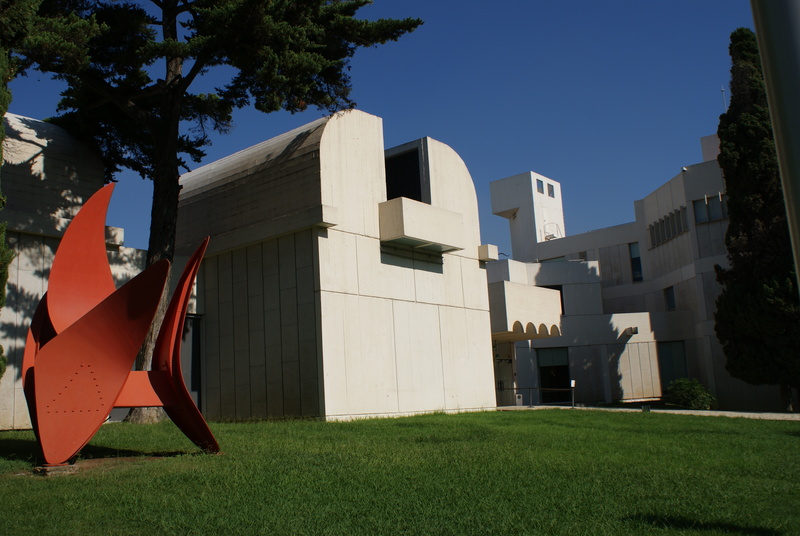 The building first opened to the public in 1975 and was designed by Josep Lluis Sert, a close friend of Joan Miro. 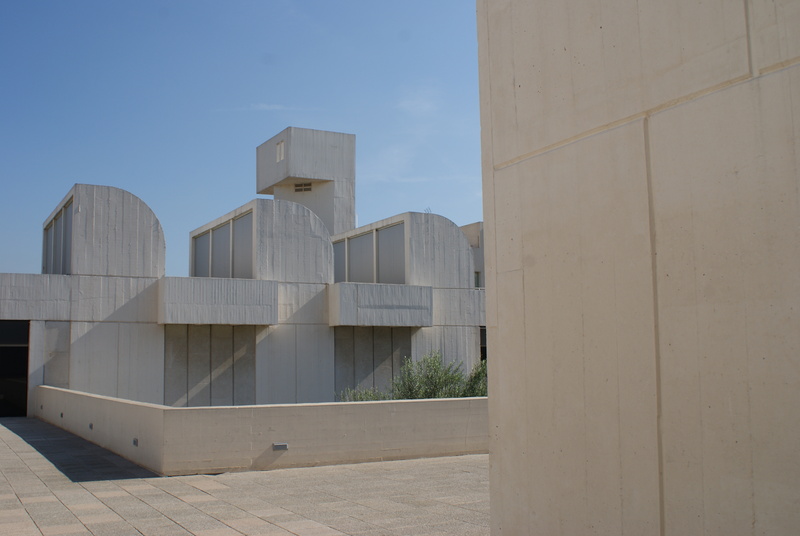 The foundation was designed in accordance with the principles of Rationalist architecture with spaces set around a central courtyard. The building is a beautiful example of contemporary architecture and is flexible enough to display artists from the 20th and 21st century. The internal staircases provide viewpoints through the internal courtyard to capture unusual shapes and open the building to the outside as much as possible. 4. 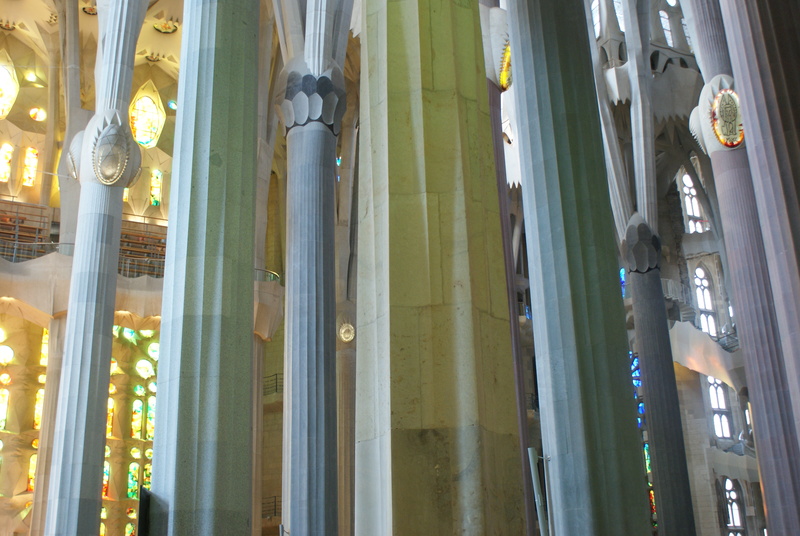 Sagra Familia. An obvious one, but maybe as such, one you might be tempted to miss. Don’t! It is ginormous and the oddest thing about being there is that they have SO much STILL to do! There is a great little animation which highlights what’s to come. 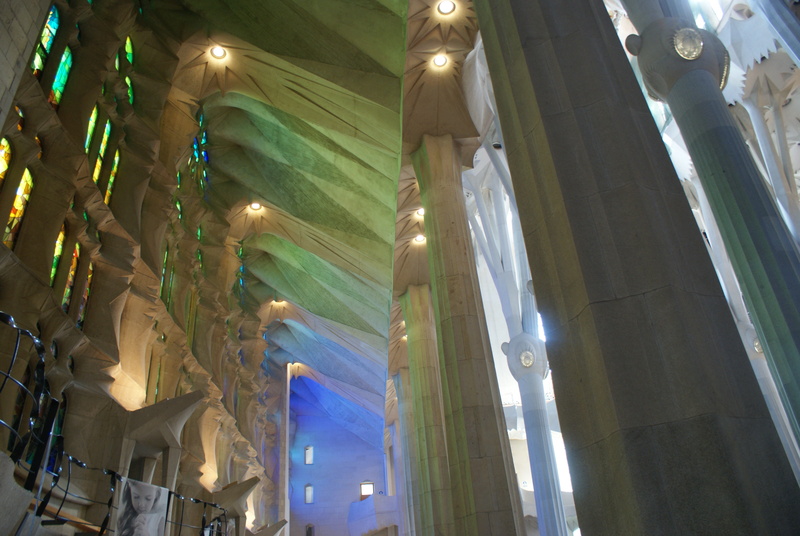 Designed by Catalan architect Antoni Gaudi, work on this build began in 1882 and its now a UNESCO world heritage site with a completion date of 2026. 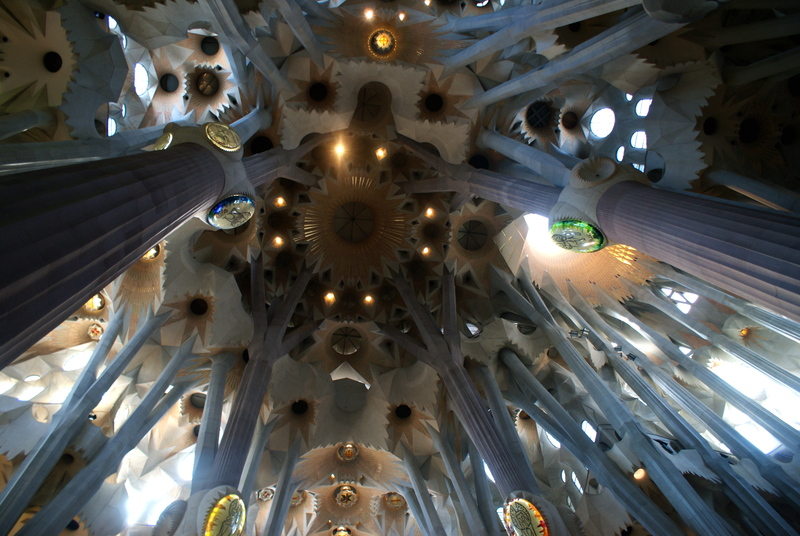 The build isn’t government funded, it’s funded by visitors and private donations to the trust and no building in Barcelona is allowed to be higher than the eventual central spire. It is a real showcase to commitment, craftsmanship and dogged determination. …and whatever you do, don’t forget to look up! 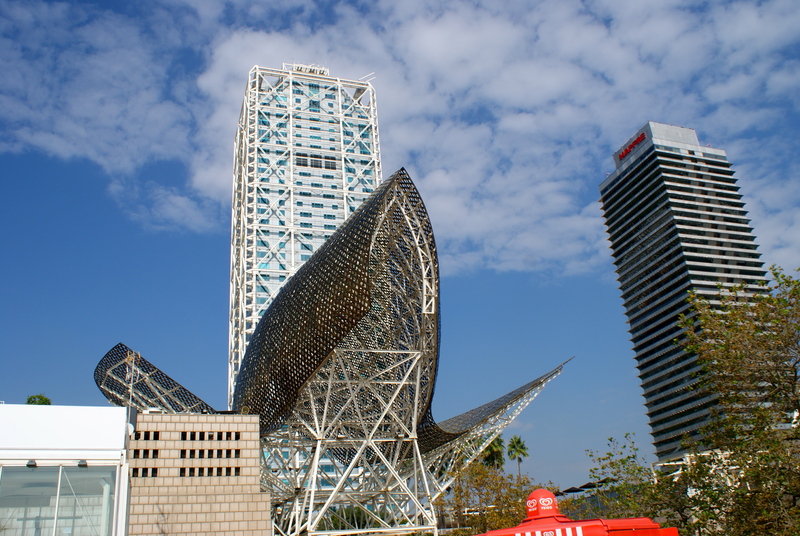 Quirky architecture is evident like the ‘fish’ by architect Frank O Gehry for the 1992 Olympics made from stone, steel and glass. It shimmers in light reflecting off from the sea in front of it. Our interest was piqued at this unusual construction on one of the piers – open studios perhaps? All in all we found Barcelona one of the most reasonably priced cities we’ve ever visited. A trip to Flax & Kale, a vegetarian restaurant, is an absolute must in the bustling La Ramblas (although avocado cheesecake was a step too far…). 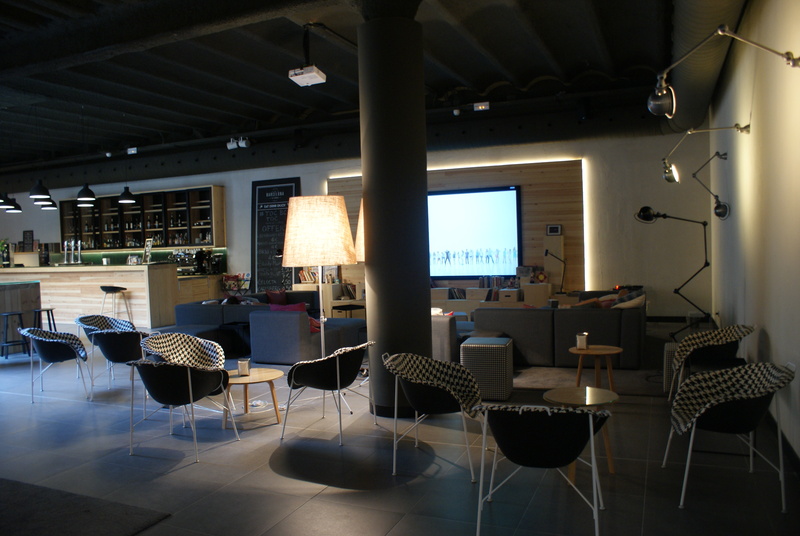 We stayed in a private room at design hostel Toc Barcelona which opened in June 2014. It has a rooftop pool, terrace, open kitchens, bar, pool area, free wifi, cinema room and a whole lot more. 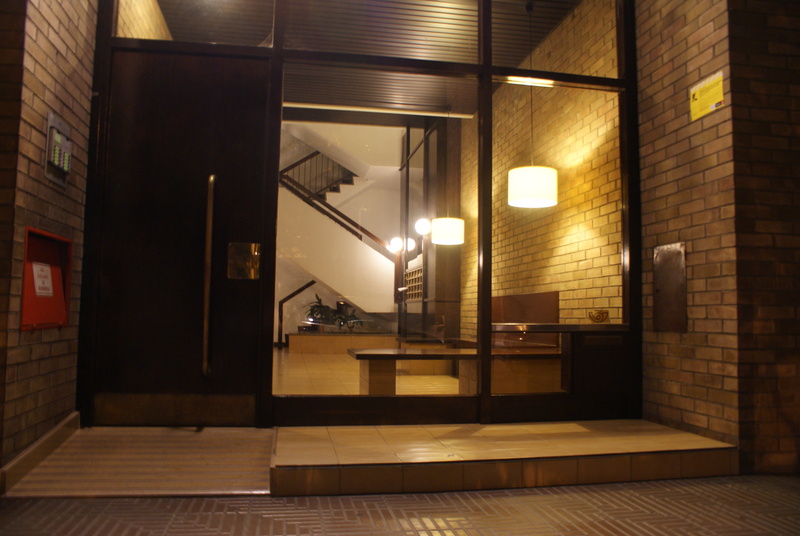 If you need a design fix weekend then Barcelona has to be up there! felices fiestas!